Whichever class you choose to start in, our Pro Shop can help you make the right decisions and also give advice on maintenance and tuning, in addition to providing service work if needed. Our pro shop is stocked with an extensive inventory of parts and supplies. 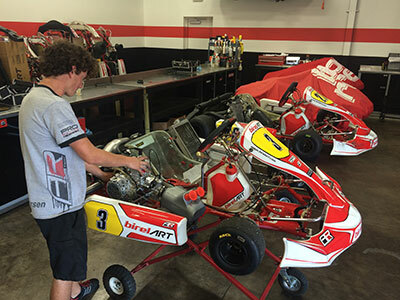 As dealers for Birel, Freeline, and Rotax, we can service your needs no matter what kart you drive. If you’re just getting started in karting, we can provide the best package for your needs and some expert training so you can achieve good results right away. We carry everything you need to outfit your new operation, from chassis and engines to helmets, racing gear, apparel, parts, equipment and accessories.